While the rain doesn’t exactly put me in the festive mood, tis the season for holiday party outfits galore. This year is lining up to be one the busiest, so I’ve got a few holiday party outfit ideas lined up with suggestions on what you can wear. This first dress, while a little bit over my typical price point, is a beautiful, classic dress that comes from designer Lattori. I was recently offered a discount code from Klout Perks (which if you’re active on social media, you really should sign up for!) and I happily picked out this one. It’s unlike anything I own in my closet which is exactly what I like about it. 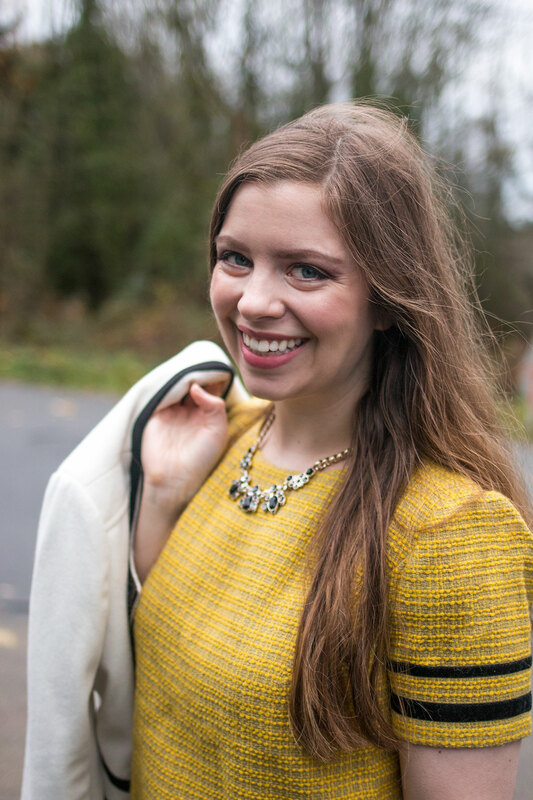 Speaking of statement jewelry, I’m excited to be bringing another giveaway to you today! Today’s giveaway comes from Seattle-based JJ Caprices for a pair of beautiful, handmade earrings from Guatemala. These black shimmer beauties will dress up any holiday party outfit you have planned this year. Get yourself entered below! What holiday party outfits do you have planned this year? I’d love to hear about it in the comments below! I LOVE the Aura Posts by AMARO!! Love the style of the dress, but I am not in love with that color. The coat is super fab, though. Thanks Breenah! Totally understandable. Yellow isn’t a color I normally wear but I thought I’d try something different! LOVE the coat! It pairs so well with that dress! You look adorable! This dress is so so pretty on you! Love the lace! Such a lovely outfit. The dress is so pretty <3 I'm a sucker for anything that colour. GORGE. Love you in that yellow, Jenn! I love the ELEGANT DROP PEARL JAM NECKLACE BY AMARO! This dress is adorable! I love the color and texture. Great styling. You look lovely. I went to their site and I love the dazzle stone earrings by LK designs.